Typically, police departments turn to a standard bag of tricks to dissuade speeders: Unmarked radar units, speed cameras, even the occasional 1,000-horsepower Corvette Z06 cop car. But one police department in Australia decided to harness an even greater force in its quest to quash out the leadfoots among us: The power of Internet shaming. Despite having literally invented the word “hoon,” Australia is notorious for its draconian enforcement of driving laws. The penalties differ between the various states and territories, but going 25 mph over the speed limit anywhere on the continent will cost you your license and a four-digit payment to the state. There are even rules specifying the penalties for going less than 10 mph over the speed limit, so don’t look for our comforting buffer zone if you’re driving Down Under. At the same time, in a land full of deserted, arrow-straight highways and rear-wheel-drive burnout machines, mere laws aren’t going to be enough to stop people from putting the hammer down. 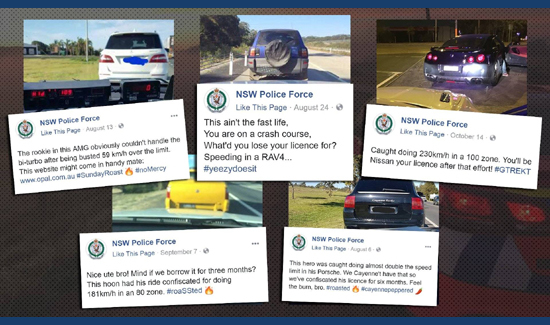 So, using their Facebook page, the New South Wales Police Force decided to try out a novel solution for the problem of speeders: Make fun of them. Honestly, even if you live on the other side of the world like us, the page is worth a follow if only for the amazingly creative, pun-filled roasts of particularly determined speeders that wind up posted regularly. Pictures of their stopped cars—sometimes with the radar readout in the frame—are accompanied by a caption that either mocks the driver’s incompetence or teases them for getting hit with a massive fine and losing their license.